Tuolumne Meadows Visitor Center is in one of the great meadows. It is penetrable because of the park roadway that crosses the southern edge of the meadow. This roadway signifies the northern end of the largest contiguous roadless wilderness throughout the continental United States. The views that the meadows offer are spectacular. 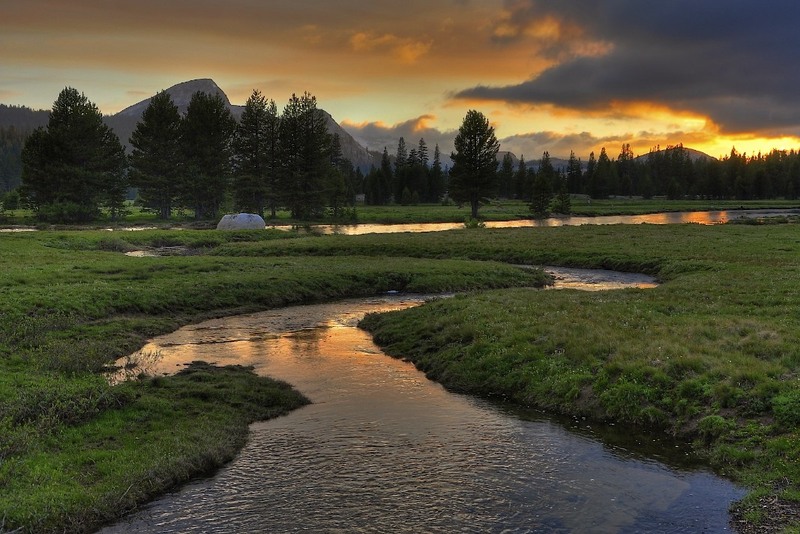 The Tuolumne River winds through the carpet of the meadows. Dramatic, spectacular granite domes and peaks also cradle the meadow. The views of Tuolumne Meadows are probably most striking early in the spring season, when the meadow wears an emerald green robe and dons a blanket of brilliant wildflowers. Although the meadows attract a lot of tourists, they constitute a broad landscape, so you will encounter others few and far between throughout your journey. The sub-alpine meadow altitude is 8.575 feet high. The meadows are considered to be Yosemite National Park’s epicenter for back country hiking. The meadows are also an easy day trip from Yosemite Valley. The visitors’ center of Tuolumne Meadows is only open during the summer season. Sights near the meadows include Olmstead Point, which is one of the best Yosemite vistas anywhere, Tenaya Lake, which is a lovely alpine lake right beside the road just a few miles before the meadows, and Soda Springs, which is appropriately named for their naturally-carbonated waters.